FastStone released a new version of the company's picture viewer FastStone Image Viewer today that brings the version of the application to 6.6. FastStone Image Viewer 6.6 improves the performance of certain operations in the application significantly. Users who noticed slowdowns when they browsed large collections of images on their devices or when they opened folders with lots of photos may notice significant loading time improvements. The release notes list three areas in which performance was improved: when loading images, when opening folders with lots of images, and when using copy or move operations in the application. FastStone Image Viewer processes embedded ICC profiles faster in the new version and supports these by default now (enabled by default). Note that the use of ICC profiles may slow down the loading of images. Tip: You can turn this off in Settings > Settings > CMS > Enable Color Management System (CMS), i.e. Color Space Aware. I tested the performance on a medium sized folder. It had 554 photos and a total size of 4.75 Gigabytes. While it took a moment to parse the entire folder and display thumbnail images for each of the photos it included, the loading of individual images and the switching to other images stored in the folder was instant and without delay. The same operation is slightly delayed in other image viewers such as XnView or the Photos application on the same system, and also in previous versions of FastStone Image Viewer. 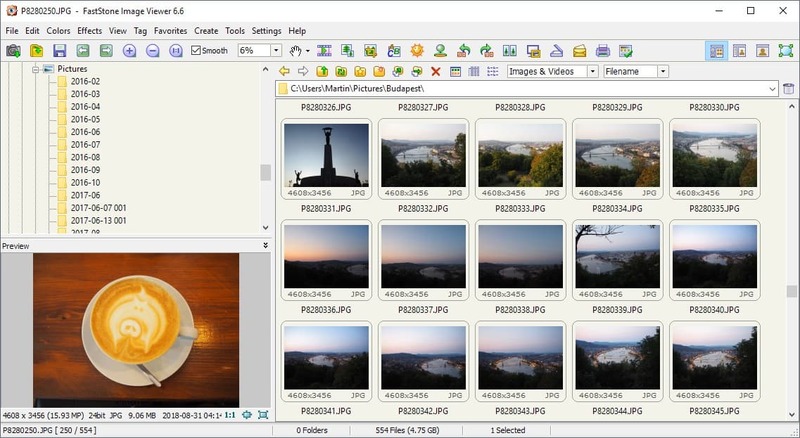 The new version of the image viewer includes several other improvements. The program includes two new options when the magnifier tool is active. The magnifier is active by default when you view an image using the program. A single-click with the left mouse button displays the image in the original size (100%). You may press and hold the left mouse button to activate the magnifier and use mouse movements to inspect certain parts of the image while the magnifier is active. What else? The video player which the developer introduced in version 6.3 received another batch of improvements. 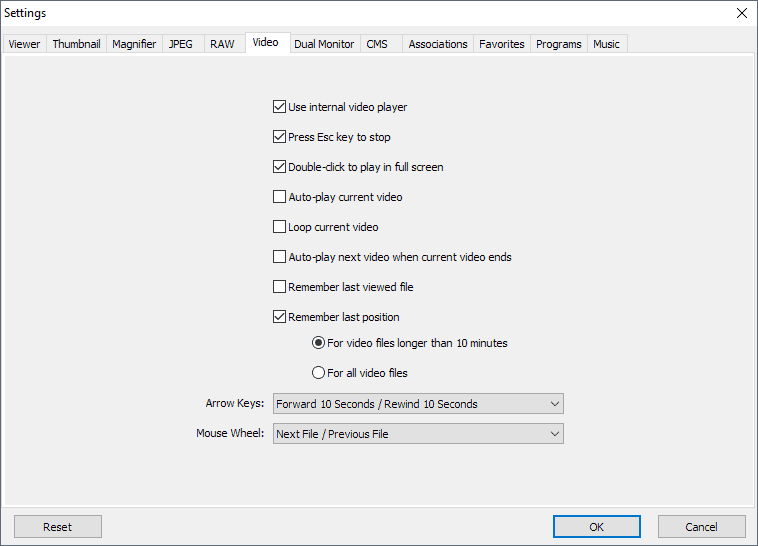 New auto-play and auto-loop options are listed in the program settings under Settings > Video. A play bar is displayed automatically when videos play in fullscreen mode when the mouse is moved, and the time is displayed when you hover the mouse on the progress bar of the video. 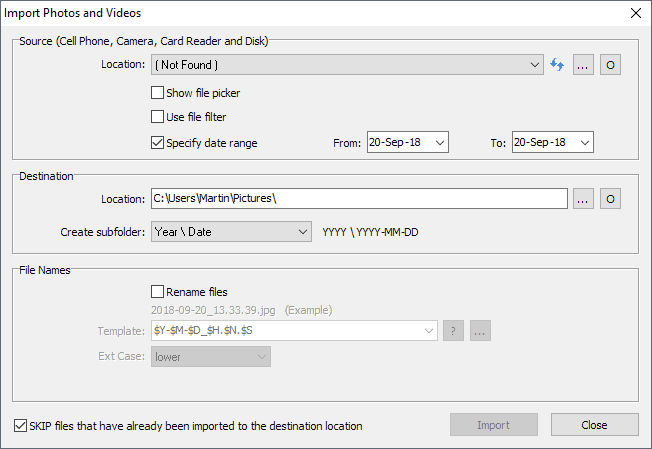 FastStone Image Viewer 6.6 features a new date range filter for photo imports, and improvements to the built-in batch converting and renaming tools. Check the "specify data range" option of the import dialog and set a starting and end data for the importing of photos and videos. FastStone Image Viewer got a whole lot better with the update to version 6.6. While you may like all the new functionality added to the application in the new version, it is the performance improvements that make it a must-have application. The improvements are significant and visible. While your mileage may vary depending on factors such as image size, type and the computer that you use, it is likely that you will notice performance improvements as well when you run the new version. Now you: Which image viewer do you use, and why? I prefer IrfanView, because it seems the closest to the default Windows Photo Viewer. tnx , will check it out tonight. with the version i’m using atm, it can almost take a minute to load some folder information, and then the indexation & sorting still needs to happen. but those folders have more then 100 000 pictures in them, so nice test case. Yandex.DNS can’t resolve this either. I had to switch to my ISP’s DNS resolver, which worked fine and I could access the address. I wonder where the problem is so I can contact them and have this solved. I was inclined to believe it’s on Yandex part, though they have always been reliable in the past years I’ve used their service. This is the first time I encounter such an issue. I use GoogleDNS and have no issues accessing the website. I think a lot of ISPs use GoogleDNS anyway. I’m still using ACDSee 3.1. If it works, don’t fix it! Also why don’t FastStone Image Viewer or any other new imagebrowsers still don’t use/even offer as option to use type of “main window” where you can move easily/fast between folders/pics just by using PageUp/Down/Enter keys just like in ACDSee.. I just don’t get it.. Still using old ACDSee, have yet find small fast simple viewer that would even offer as option a similiar main Window where you can navigate between folders/view pics just by using PageUp/Down and Enter keys just like in old ACDSee.. i just don’t get it why , the best way..
Arguably, it was much faster. Replaced the old but good and discontinued Picasa, for those who have big albums of pics. Been using HoneyView for years and I’m perfectly happy with it. It’s fast, doesn’t have much bloat and has some handy features. The only downside is hasn’t been in active development for quite a long time now, so it only gets security patches and some bugfixes. FastStone has been my default viewer and editor for years and I’ve tried most everything out there. Simple interface, no updates baggage, silly overblown web site or “Look at me!” stuff, the way software should be. Happy to donate for this. Ver 6.6 loads thumbnails faster and opens folders with lots of pix faster. Improvements when it seems everyone else is making their products worse! Yay! For heavy duty pro type editing, I use Affinity Photo, it can produce some spectacular photos, but for viewing and most editing FastStone has plenty of options. 6.4 to 6.6: Not seen any “performance” improvements on my side?? FSview was my choice back in the windoze days. Pity they don’t make a linux version, I’m stuck with the heavy xnview. FS viewer is awesome. Not sure I’m liking the direction they are adding to the software. Aka adding video viewing. Already have tons of awesome palyers (ex potplayer) for this functionality. I need FS viewer to stick to image viewing. My goto viewer for literally 10 years. There’s a setting to turn it off. I’ve tried Irfanview, XnView as well, FastStone Image Viewer is the best of the three and the one I use. It has tons of of batch image editing functions built into it, more than the others IIRC. I’m unable to Open 3 Separate JPGs and make a Composite JPG of the 3 for a Forum post. Open 2nd JPG overlays the 1st in Single view area. IS THAT a reality of the App? MS Photo Viewer was used instead. Looks good otherwise.